Plants have specific needs and requirements that if not met will result in a very poor showing indeed. Understand these requirements and pick plants appropriately. How much sun is required? 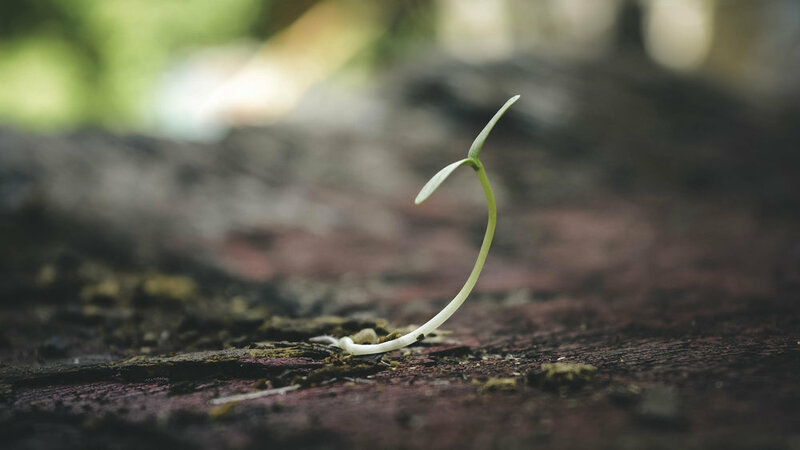 What is the moisture level of soil? How big does it get? How quickly does it spread? Common Milkweed is a beautiful plant that requires sun and dry to average soil moisture. It spreads rapidly. Put it in a wet shady spot and it will soon meet its maker. Put Swamp Milkweed in a wet sunny spot, and it will thrive. Know the areas that you wish to plant and pick plants that match the conditions. The best growing conditions are listed for each plant, shrub and tree available from Plants for Ecology. Before you start to remove plant materials, you may already have natives present. You can leave them there or you can set them aside and replant along with the other plants being installed. 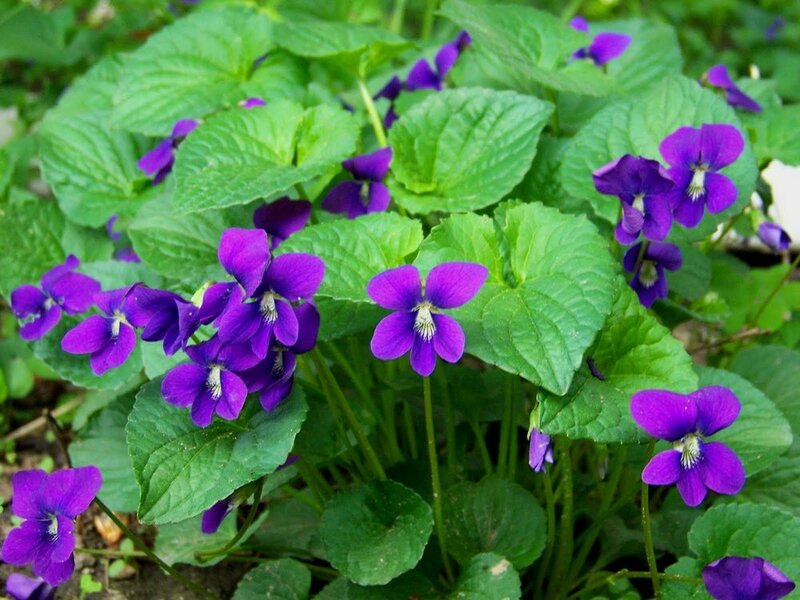 A very common native found throughout our landscapes is the common violet. It forms a wonderful groundcover and has very pretty blue flowers. Long the bane of turf grass promoters, it is a species that should be welcomed with open arms. Larger shrubs and trees can be difficult to remove solo, so you may want to recruit some assistance or you can hire a landscaping business to handle the removal. Make sure you are clear about what stays and what goes. Ideally, all non-native flora should be removed from the area being planted. In situations where it is very difficult to dig up existing vegetation, one may choose to smother the area with cardboard soil and mulch. 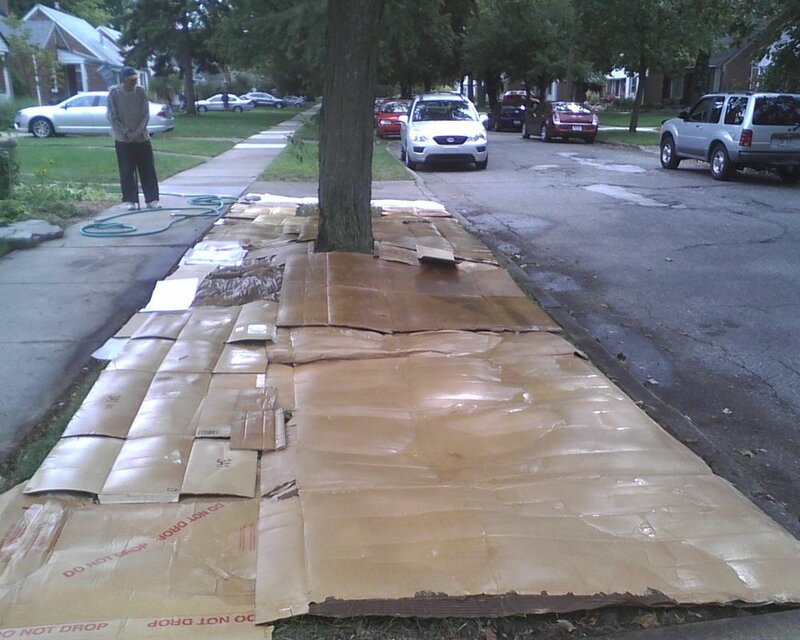 Cardboard biodegrades in a short time but last long enough to kill what is underneath. Chemical herbicides are strongly discouraged. Sod should always be removed unless the area will not be planted right away, as turf grass can be very aggressive. For large areas of sod, sod cutters are very effective and can be rented by the hour or by the day. Areas not being planted can be smothered and planted the following season. The removed sod can then be piled and covered in mulch, as it will break down into a very nice soil. Once the plant materials have been removed, the beds should be amended with rich compost, as that will give your new plants a nutrient rich medium in which to thrive. Now you are ready to plant. A rule of thumb is to make planting holes twice as wide as the root ball or container and avoid planting too deep. Ideally you want plants to be at the soil line whereas trees need their trunk flares above the soil. 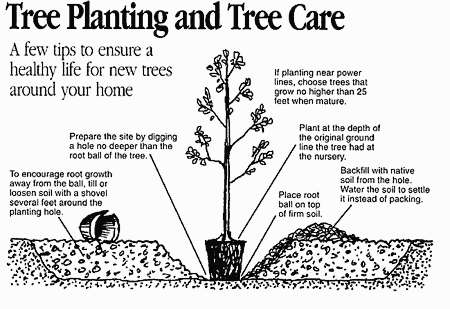 You are pretty safe planting nursery grown trees at the soil line established from the container. The biggest mistake made when planting trees and shrubs is planting too deep! Make sure to keep the beds evenly moist until the new plants have established. After everything has been planted, it is recommended that the new beds be mulched. P4E recommends straw w/o seeds for the first year. It is a very forgiving material and will not smother young plants. The role of mulch is to retain soil moisture, and to add organic matter to the soil as it breaks down. If you want a more formal look, you can use hardwood mulch as well. It is very important to keep mulch away from the base of new plants as this can damage the plants. Those going for a very natural look can use what nature provides-leaves! I especially like the leaves of a Honey Locust tree. As a final step, mark the areas that you have planted, so you can track the progress of your plants. It will help you to identify the plants and help remind you that something is planted there. You do not want to dig up what you have just planted the previous season! Very old White Oak living happily in the "D"
When designing a landscape, one can choose a very formal design to a very informal arrangement (and anywhere in between). All require work, but I do believe that very formal designs are more labor intensive. I tend to use a combination. For example, I will have very defined bed lines but the beds themselves will be planted is if the flora were dispersed at nature’s providence. The size of the property matters greatly. Those with large properties will need to approach things differently than those in smaller denser communities. For example, a large shade tree may not impact the sun/shade ratio of a large property much but it will impact greatly one whose yard is small. Even so, large or small, a majestic tree like an Oak can be a wonderful anchor to one’s property and a mecca for wildlife. Municipalities all have codes and rules that govern how property must be maintained. Generally, your property must be well maintained, and you should act like a good neighbor. A well maintained landscape is the best advertisement for native plants. The hallow area where the leaves attach to the stem form a "cup" that holds water for thirsty visitors! Water is an essential part of any habitat. All living creatures require water to sustain life. A reliable source of water will encourage creatures to visit and even take up residence in your square of living green. Water features can be as simple as a birdbath to as complicated as a pond and stream. 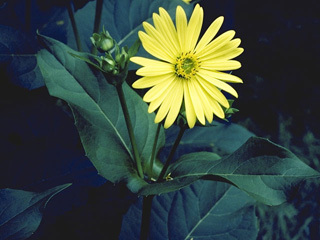 Cup Plant, or Silphium perfoliatum, is very interesting indeed. It received its common name as a result of how its leaves attach to the stem, as it forms a reservoir that captures and retains water. This water is then utilized by a wide variety of wild visitors. A living water feature! A rain garden is a special type of water feature that is designed to channel rain water and prevent it from being wasted as run-off. In simple terms, rain gardens are sunken garden beds to which water is channeled by various means, but the water does not pool. Instead the water is utilized by the plants or becomes ground water as it percolates down to the water table. A very common method of directing water to the bed is by redirecting the downspouts on one’s home so that water flows into the rain garden. Although water does not pool, rain gardens are very moist, so plants that love their roots to be very moist are ideal for such a garden feature. Eupatorium perfoliatum, or Boneset, is an ideal plant for a rain garden. Plants for Ecology has a list of plants that will do great in a rain garden. If you are a property owner who has naturally occurring water features such as wetlands, ponds, steams/rivers, or lakes, then you are in a very special and wonderful situation, as this gives you a great opportunity to create an incredible natural habitat. The creation of buffer zones or riparian borders is an excellent way to protect water quality and create dynamic habitats. These borders filter extra nutrients and pollutants before they reach the water, and they also stabilize the banks and protect against erosion. Property owners who have these special features on their landscape have a responsibility to act wisely and protect them. There are also state and municipal regulations that govern and protect these waterways. For those wishing to plant along the water’s edge, it is very important to understand the ecology of the area, so it would be wise to consult with those who are experts in natural area management and restoration.